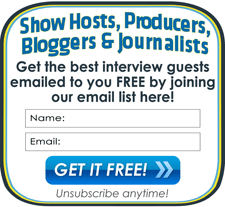 Please complete the easy form below so we can add your new Guest Expert Profile to the Interview Guests Directory. Please note that your submission is subject to the Terms at the bottom of this page. If you have questions or suggestions you can email us at pr @ interviewguestsdirectory.com. - We will publish what you submit "as is". - You are responsible for any typos. Fixes or edits may incur a $20 editing fee. - This is a web site and email based service only - not a print publication or mailed newsletter. - Placements are posted (and emailed) on a first-come first serve basis (newest first, oldest last). - Payment due in advance via credit card processed by Paypal. - You can cancel your billing agreement anytime. When you do, your placement will immediately be removed from the site and/or emails (not at the end of the monthly billing cycle). - You warrant that you own all rights to any images or content you submit to us for public posting and that you release us from any and all liability associated with reproduction of your materials and all use of our services. - Service offerings, listing details, and pricing are subject to change. - Please allow 3-6 business days to produce and post your listing. And if you are simply looking to REINSTATE a previously published profile, please make payment here. By submitting your listing or using this site you agree to these terms, and as modified from time to time.